We're halfway through the alphabet! Thirteen weeks and we've stitched A to M and made thirteen pincushions...well, I have, and after today so will you. 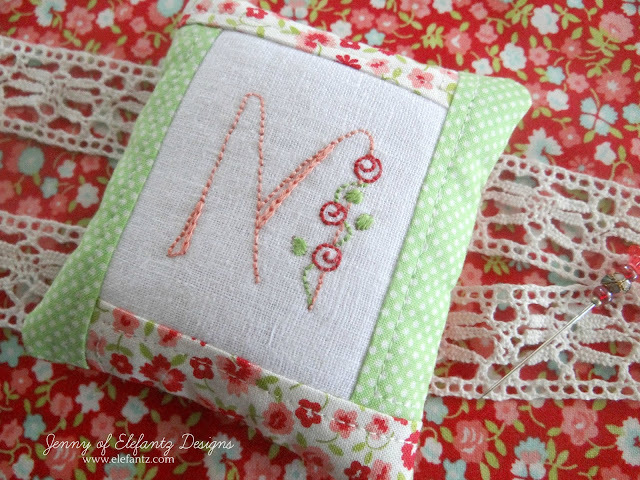 According to statistics taken last year, M is the second most popular first letter for a girl's name, which makes me think this week's design might be stitched a number of times if you're making them for friends or family. A was number one and E was number three just in case you wondered. I've given M a lovely soft flow and finished it with a climbing rose. The borders are sewn left to right around the M block so that the end of one is overlapped by the following border. I love how such a simple change in piecing adds something sweet to this pinnie, and it's a bit different to the sides first and then across the top that I usually do. The green spot is an old Lecien basics and the cream background floral is Vintage Picnic by Bonnie and Camille, both from my scrap box! 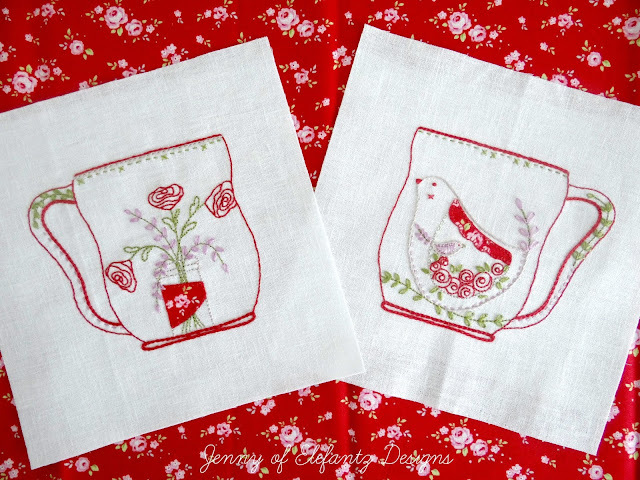 I've already prepared the next two alphabet stitcheries ready to embroider on their pincushions and as I was choosing fabrics for them my heart was warmed by the fact that I only need small pieces and a few threads to make these little projects. It's become a joy to make something useful and pretty from my scraps. Have you discovered that too? Download the pattern for M here or here. The pattern will remain free until December 6th, along with J, K and L. Just scroll my blog for the links to those patterns. The sets for A-E and F-I are $2 each here in my shop. It rained last night which was wonderful for the gardens, however, it has brought the most horrid humidity to the tropics where I live and now we're bracing for a super dooper heat wave with temps hotter than our normal hot. Funny thing about our cat Sophie, though. She loves the heat, sleeps outside under a bush in the middle of the day and only wanders inside at tea time for her supper. As I was checking the large hedge bushes out back this morning she fell at my feet and would not budge...think it was her hint for a photo shoot because as soon as I took her piccie off she went to explore more garden places to spend the day and I haven't seen her since. ...so I'll keep an eye on it and see what emerges. Caterpillars really are incredible architects. Anyhow, the not-a-lily-pily shrub has me stumped. It's been dropping these little green balls that look like extremely miniature limes, or a lime skinned mini pomegranate. It occurs to me that over the next while Mr E and I shall be learning a lot about the plants in our garden, whilst also filling the empty spaces with our own green choices. So far he's built two greenhouses behind his large shed and is propagating cuttings from a variety of trees we've come across on our Saturday morning drives. That one I asked about a few weeks back (here) was in fact a spindly nectarine and the flower died two days after that photo because we do not have any cold weather here so it cannot set fruit. In the big scheme of things we need our garden space to be two things, shady and productive, so it has been removed and hubby will be planting river gums instead (we're not far from the river). Out front of our home the previous owners filled in much of the yard with compacted road base but we're more the dirt, grass and trees kind of folks. 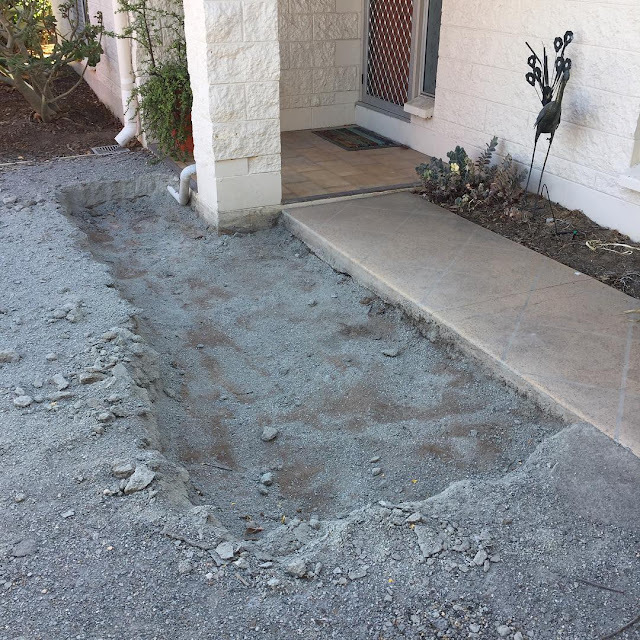 Bit by bit hubby is breaking through that road base and digging it out so we can fill it with good soil and make a start on our garden plans for across the front of the house. Shade trees are high on our list as well as a large noise barrier that will look like a rock garden when it's finished. Since staying inside in the cool will be the best way to cope with the high temps this weekend and into next week I've some sewing plans afoot. No joke, I have about 200 original stitcheries stored away that I intend using in projects - some to gift, some to use here at home and some to sell next year. These little mug designs are destined to be mug rugs by this time next week and I'm thinking a cute little patchwork block added to one side will be perfect. When I designed them a few months back I chose the predominantly red and green palette for Christmas, thinking they'd be perfect as gifts this time of year in a project or framed. But as the design itself is not festive they could be stitched for any occasion all year long. I mean, imagine them in soft pinks and blues, or in those bright 1930's prints? I've trimmed the blocks to 6 1/2" square and will choose a couple of 6 1/2" square patchwork blocks tonight, plus some fabric to compliment the stitcheries. The red floral is an old Tilda print and no longer available so I'll use a little from the piece I still have but not a lot. Maybe I'll get carried away and have something very different to show you next week! 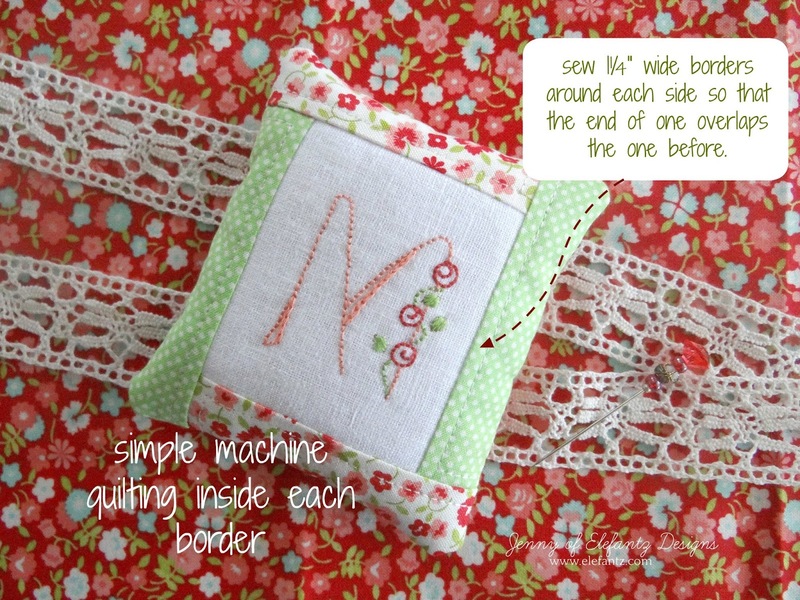 A mini quilt perhaps?? My mind is always three streets ahead of my time and ability. LOL!! I better slow down and remember there's other work that needs completing too. 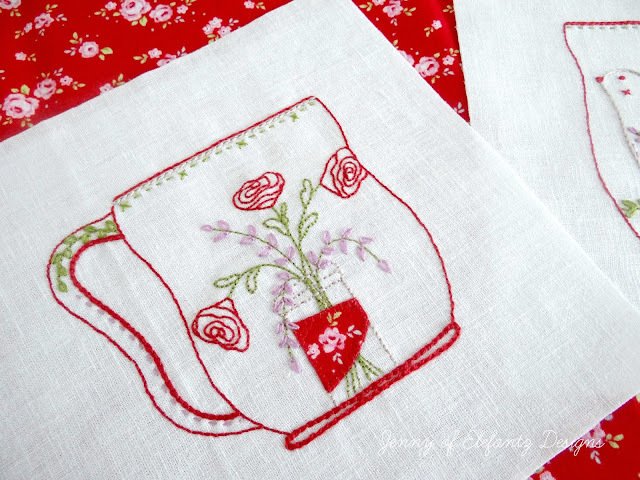 The double pattern for "Lavender & Rose Mugs" is in my shop. For those in the US I wish you all a belated Happy Thanksgiving. It's the one holiday you have that I wish was worldwide because it's not about gift giving, but being thankful and spending time around the table with those you love. May all your tables be blessed this year. M is beautiful! Thanks for sharing. You have very unique nature things where you live and it's fun to see your photo's. Love the little teacups! When your post came up on my Facebook feed this morning I was only half awake. I usually read through feedly so I never miss a post. 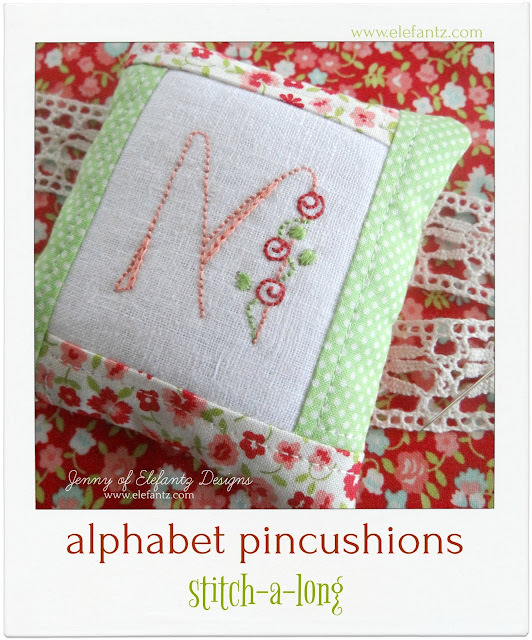 Seeing the picture first, sent my brain into confusion....are we already on the 'N' pincushion? I don't remember doing L or M? .....It didn't take me reading far into the post though, to clear the brain fog & realize I was looking at the picture wrong! Another beautiful pattern but I guess somehow I did miss L. With the Thanksgiving holiday I need to go back & find it. The little little cocoon looks very similar to bagworms, which are very bad here. We are not happy to see them & have lots whole trees from them. Yours doesn't look exactly like ours though...hopefully it's a good caterpillar. Thanks again fro another lovely post. Stay cool & safe in your heat wave. Hi Jenny, I thought about you wishing you all had a Thanksgiving holiday. Start your tradition to include a Thanksgiving every year. Most have turkey here in the States. But you can have whatever meats you enjoy. A big family dinner each year is really nice. We all bring a dish or two to help out. A lot of fun. People look forward to a big get together with thankfulness and good food. Congrats! on the new house. It looks beautiful! Nice that it has a pool, too. Here in my state of Ohio, we are due for snow anytime soon. We have four seasons here. So a white Christmas may happen this Christmas. There's always something to be thankful for and even though we had a rainy summer on our farm here in the States, we had a wonderful Thanksgiving and thanked God for all He's provided. I'm one of those people whose name starts with M. Thanks for this stitch-a-long. While you're having a heat wave, we here in western New York State, US, are in the deep freeze. It was 4 degrees when we went to bed last night and yesterday was the coldest ever Thanksgiving Day in the Rochester, NY area. So it's wonderful to see pictures of your tropical plants, giving hope that we will see green again some day. 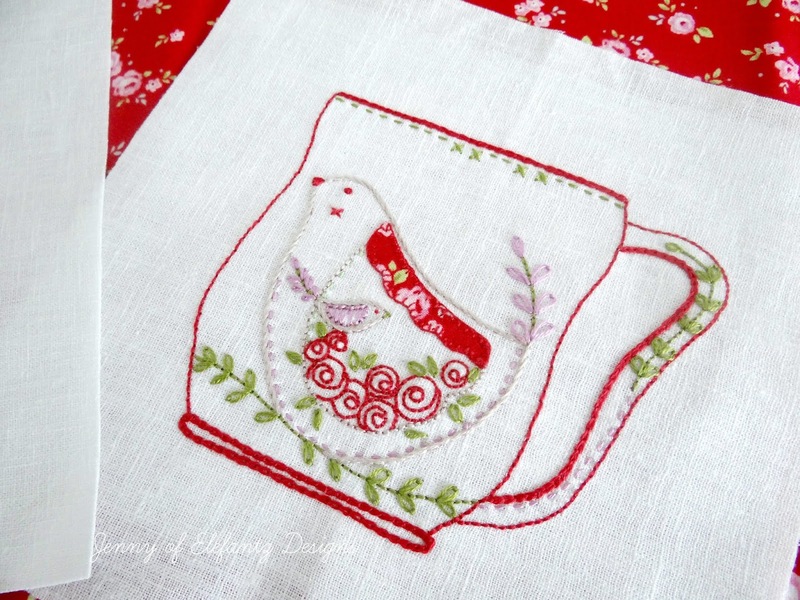 Hi Jenny, thanks for another lovely pattern. Not sure what that cocoon is, but your tree is a little guava, it could either be a cherry (ei reddish) or pineapple (yellow) guava. They usually only fruit in autumn/winter. They are delicious, needs water and be careful with fruit fly. They only grow about the size of a tiny tomatoe. Goodluck with the garden. Love, Guida. Thank you so much for the M! I have two good friends whose names begin with that letter. Who knows when they might get a pincushion? =) I always love a tour of your gardens and trees, so don't think that you are showing too many pictures! I would never even have guessed that is a cocoon. Your cups which will turn into whatever they turn into are great, and I think they would make nice mugrugs, but they would make many other great projects, too. And ... I'm all about scraps! =) Have a wonderful weekend, Jenny! Oh baby have I been hanging out for MMMMMM. Just in time for Christmas. Love the way you think and care. Bless. Oi Jenny, obrigada pelos padrões, eu sou Ana Maria, agora vou bordar meus dois pincushions!!! Thank yo Jenny for your blessings and sharing your gift... Blessings on you! Jenny, glad that you now have a name for the "unknown" plant! I didn't think it was a pomegrante as we have one here ... rather a smallish leaf, the flower is orange and starts out as an elongated bell shape and then becomes a similar shape to your guava fruit but with a thick, smooth skin. My daughter, Anarkali's name means "flower bud of pomegranate" in Hindi. Love the mug designs ... so very pretty! Enjoy your garden! Unos trabajos bellísimos ,me ha encantado el alfiletero !!!! su jardín quedará precioso .